A nice fat Test chub for Christian Hollingbery on a tough day. Dad George fed the swim while yours truly barked orders ! Part of my job is to build support for angling amongst our politicians and decision makers. This can take the form of face to face meetings, written or oral briefings and, just occasionally, taking them fishing. Last Friday I was asked to help out at one of the annual fishing days for the All Party Parliamentary Group on Angling. Most of the MPs present had fly fished but some needed a little coaching on the art of trotting running water, especially when the water concerned was a swollen River Test on the famous Broadlands Estate in Hampshire. To make matters harder we had to contend with a biting northeasterly wind and a ten degree drop in temperature. 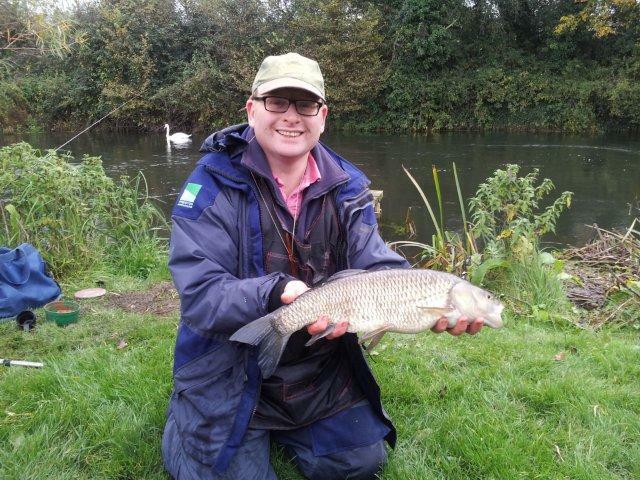 One MP who needed no coaching whatsoever was Marcus Jones from Nuneaton who is an extremely competent coarse angler. 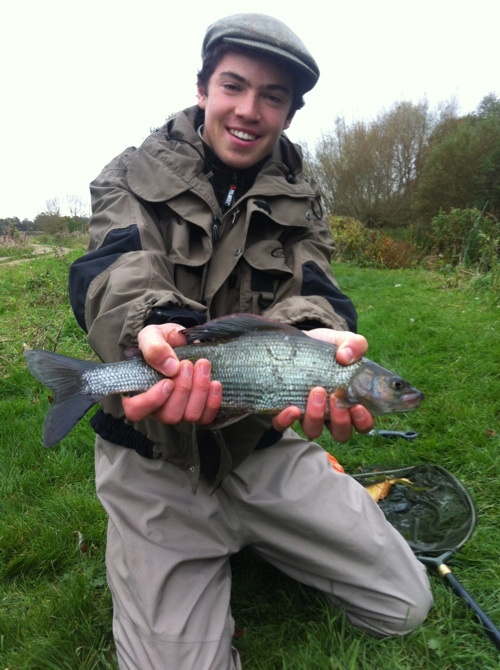 Marcus extracted a fine bag of grayling and chub from a tricky far bank back eddy and was easily the top rod on the day. We are extremely fortunate in having a knowledgeable angler like George Hollingbery in my old role as Chairman of the APPG on Angling and since George had been directly responsible for me catching my first salmon on the fly the least I could do was to offer to coach his son Christian for the day. The year before my favourite cattle grid swim had produced a hatful of chub, grayling and rogue trout but this time the fish were harder to find. Christian proved to be a determined and highly competent float angler despite this being his first time out coarse fishing. Big thanks must go to Brian Clarke from the Times who kindly vacated the swim and a rare shoal of feeding grayling to give Christian a chance of a few fish. After a while he was putting my 5 gram wire stemmed Avon float along the far bank with sufficient control to fool several nice grayling to nearly two pounds and a couple of chunky chub. He played his fish like a pro and made his old Dad, and even older coach, very proud. 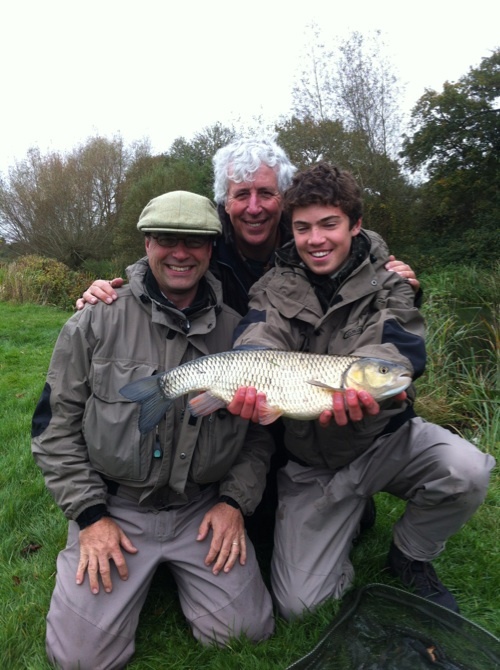 Being the son of an MP isn’t all bad – not when you get to catch grayling like this beauty. Watch out for the Hollingbery name in the world of fishing as I reckon you’ll be hearing more from these pair in the future ! Finally, big thanks to Neil Freeman and John Hall at Broadlands for their hospitality and for organising yet another great day on the water.